This Scripture has been of such great comfort to me many times and very useful. Have you ever had one of those days when you feel like the devil has you cornered? He just doesn't seem to take a break from attacking you. You want to run into the arms of Jesus and bury your face and fill your heart with His peace. Sometimes I imagine doing that. I visualize it and it makes me realize that He is always there, in the good times, in the bad times ... always! I came across this Scripture one day while I was in my Bible and it stood out to me. You know how you've read over a verse numerous times and then one day it just jumps out at you! This one was it on that day. Talking about visualizing ... this is a good one for that. The NAME of the Lord is a strong tower. The power in that name! Jamestown's sole surviving 17th-century structure. Strong towers were built in Bible times for defense. Picture a tower with thick walls and an enforced door up on a hill. It looks like a place of safety and refuge. These towers were erected in the wilderness for the security of the shepherds and to keep marauders away (2 Chron. 26:10) and they also formed part of the defenses of fortified cities (2 Chron. 14:7). Military machines for shooting arrows and stones were mounted on them (2 Chron. 26:15). Citizens found refuge in them when sore pressed by an enemy (Judges 9:51). 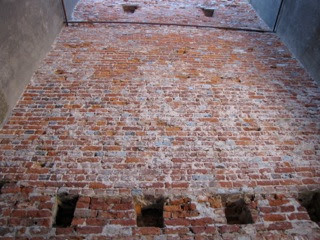 Within the massive walls the inmates were secure. From the top missiles could be advantageously discharged at the opposition. The name of the Lord is a strong tower that His children can run into, knowing that He will keep us safe. We exchange our weakness for His strength, our helplessness for His hope, our despair for His peace. When you have a day or a season of days where you feel too attacked to lift a finger in defense, don't forget the power of the name of the Lord. If we can barely raise our head above water, one Word will bring the armies of Heaven to fight for us. That Word is Jesus! There were many in the Bible who called out, "Son of David! Have mercy on me!" The Lord was compassionate to all. He understands what is in your heart without a word from you. Run to this tower, enter in and be at peace, sound and secure against all the arrows of the enemy. You are safe!